in shades of gold and frosted green with autumnal fruits and garlands. 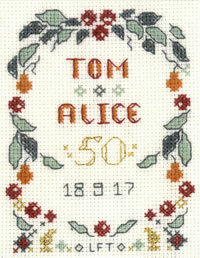 A Mini 50th Wedding Anniversary sampler available on 14 aida or 27 count evenweave. Evenweave is also known as Linda fabric and has a finer texture for a more sophisticated finish. The kit has top quality materials ~ Zweigart fabric, DMC thread, needle.